Ethno fashion models before a performance in the Karakalpak Pavilion. 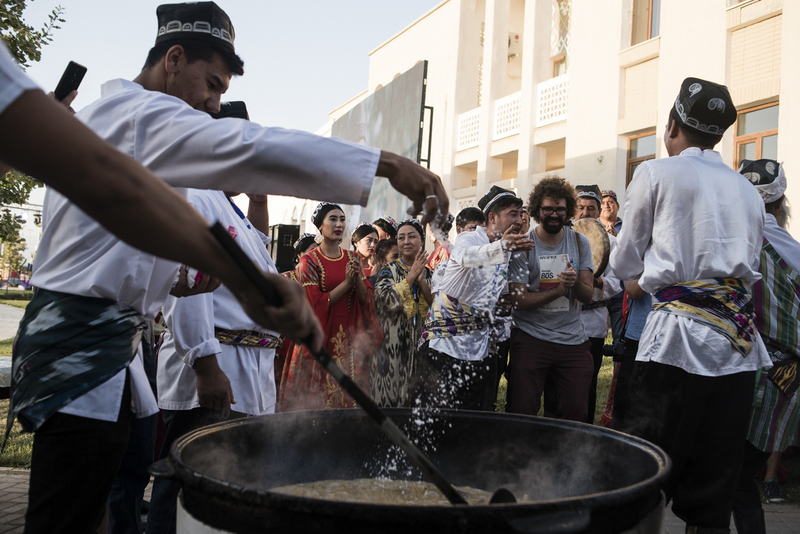 Festival participants from Andijan cook a giant vat of plov. People dancing the "Andijan Polka." 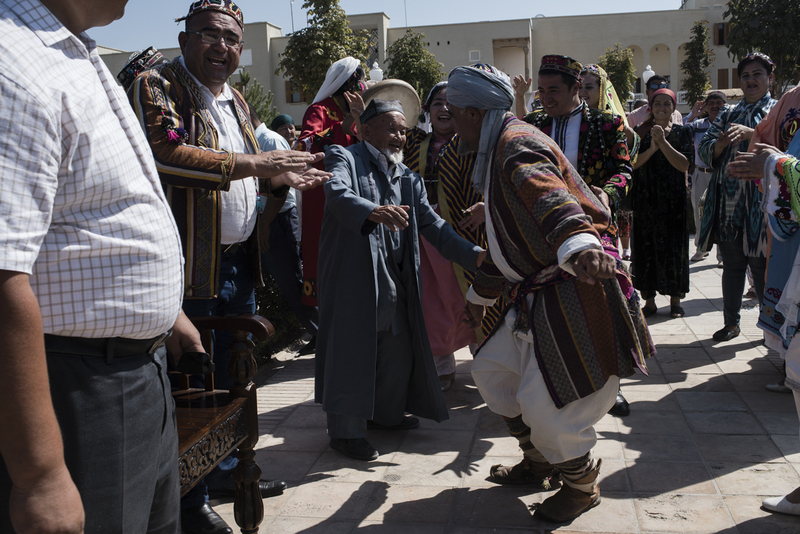 An old man dances during an improvisation of "Boisun" from Surkhandarya. 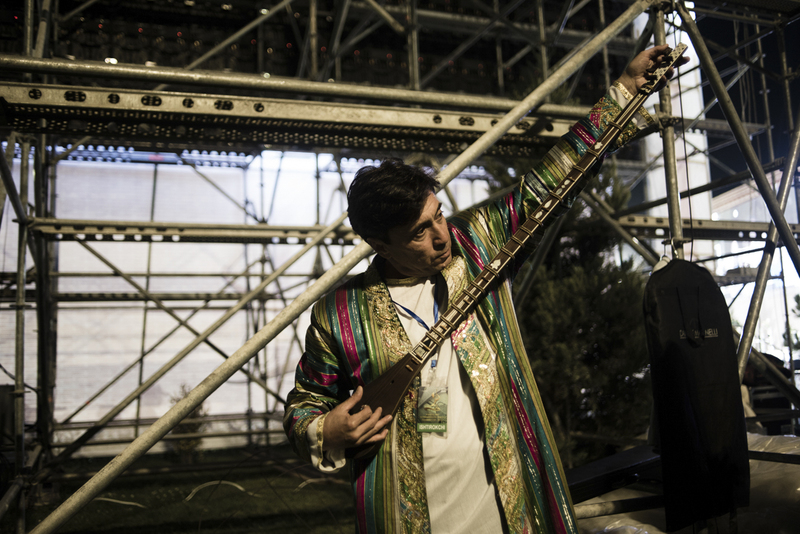 A Tajik contestant in the music competition tunes his instrument before entering the stage. 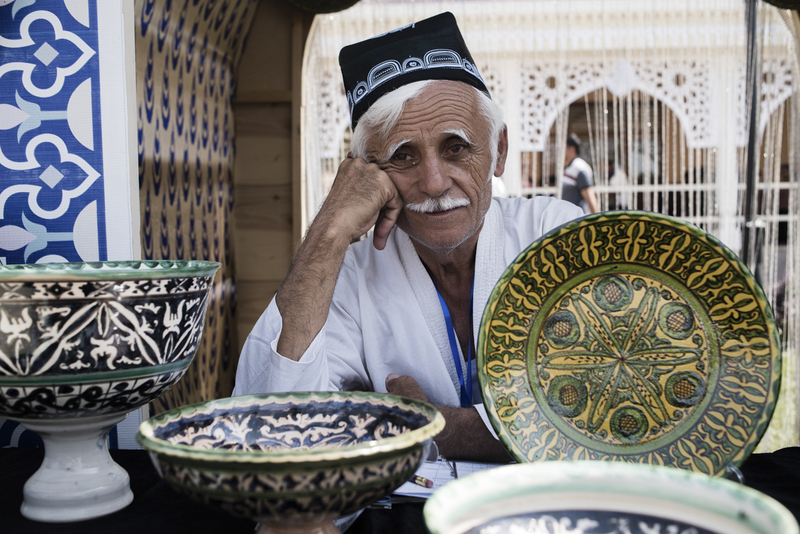 Master Mirzakbakhrom from Andijan with his ceramics. Guests dance in the amphitheater during the opening ceremony. 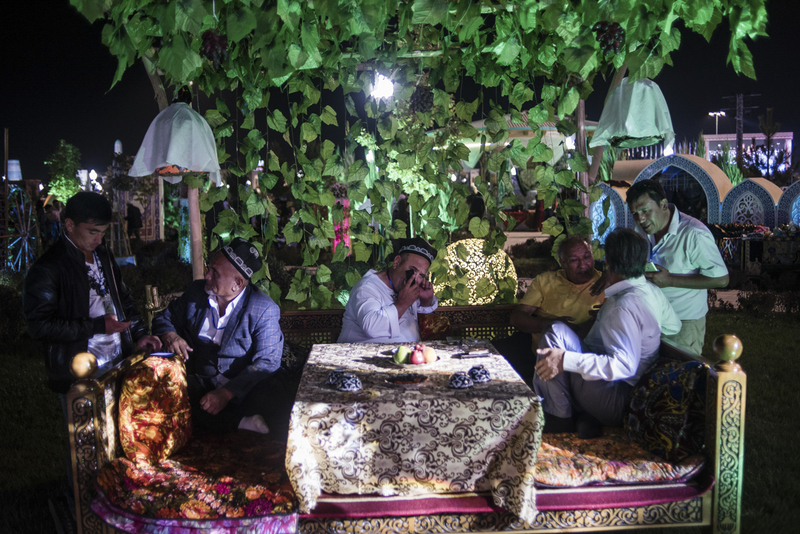 Festival goers sit on tapchans in the Andijan Pavilion. Concert goers watch a performance at the festival's free square. The sun sets over the Oq saroy complex. A whiff of basil carried on the evening wind, the shimmer of finely worked silk, the declamation of an ode to love. 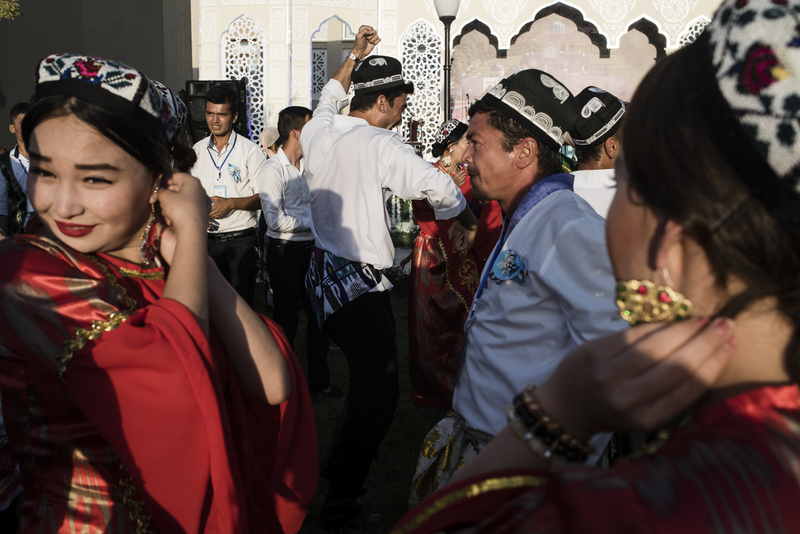 The charms of the five-day cultural festival that began in the town of Shahrisabz in Uzbekistan on September 6 were alternately subtle and broad. The drily worded official literature describing Uzbekistan’s maiden Maqom Art International Forum, with all its worthy but stolid talk of promoting intercultural dialogue through shared musical traditions, sold the event more than a little short. It would have been more accurate to describe it as an assault on the senses, an extravagant showcase for a would-be emerging tourist powerhouse, or just a good excuse for a party. Speaking before the inaugural concert, President Shavkat Mirziyoyev paid tribute to the festival’s raison d’être – the maqom, the melodic modes that encapsulate the essence of traditional Central Asian music. “The six maqom, which are the fruit of our peoples’ musical imagination, are like six brimming rivers flowing into the ocean of world culture, filling and enriching it,” he said to a burst of raucous applause. 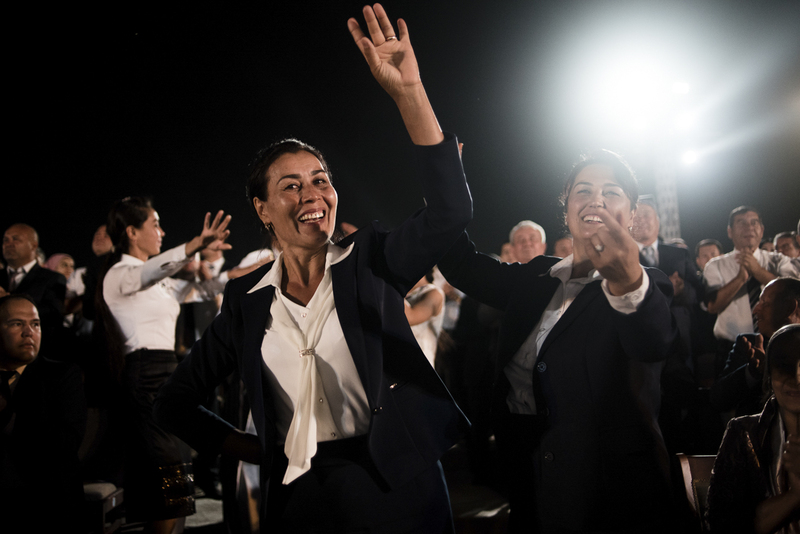 A chromatically dazzling whistle-stop tour through the highlights of regional Uzbek musical, dancing and sartorial styles followed Mirziyoyev’s speech. In a virtuoso choreographic feat, the several dozen performances were weaved into a single extended sequence that never ceased once for costume changes or stage rearrangements: an unbroken three-hour musical with a cast of hundreds. Choirs, dancing troupes, child singers, players filed onto the stage through a gently sloping ramp at the rear and floated out as gracefully as they arrived. The musical mood transitioned seamlessly from sparse and mournful to joyful and exuberant, and somber to frenetic. 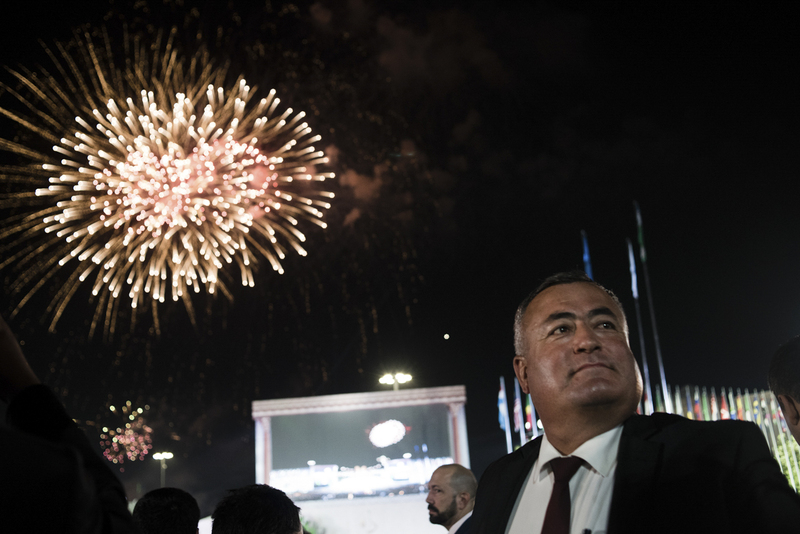 There was some modern Uzbek crooning thrown in too – with one piece performed by deputy Culture Minister Ozodbek Nazarbekov. Midway through the show, torch-wielding horse riders did a circuit of the amphitheater, and in the distance, almost entirely out of view, a tightrope walker performed heart-stopping acrobatics in time to the music. The first night was only for privileged guests. Performing artists from around the world, diplomats, government officials and journalists were the only ones allowed into the sprawling venue. That left many Shahrisabz residents and other ordinary Uzbeks visiting from elsewhere grumbling they would not be able to get a look. 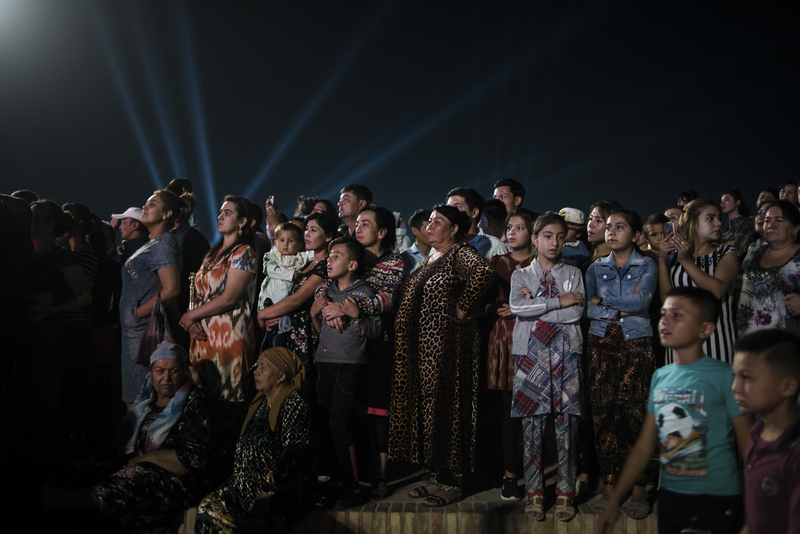 By the second night, a Friday, however, the doors were flung open and the grounds were duly packed with families taking in the sights – in effect a Disneyland of Uzbek culture. 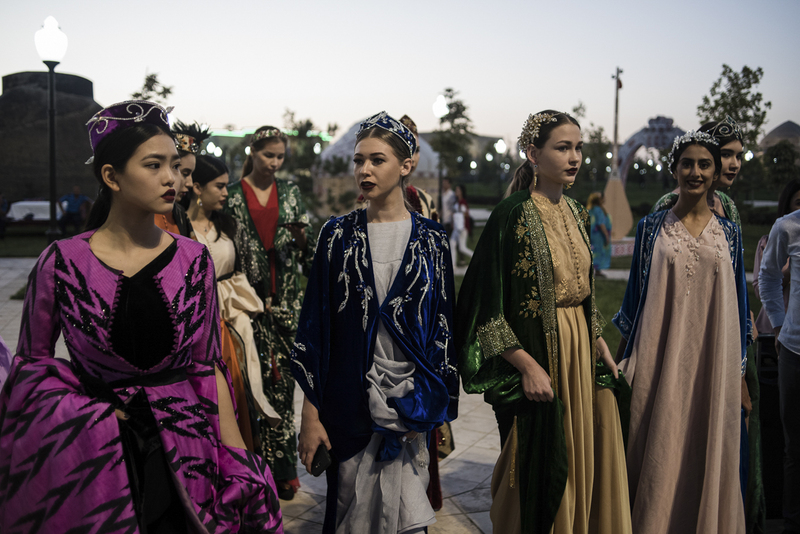 Ensembles from around the country put on mini-concerts in regional pavilions; models plied a catwalk in traditional-modern fusion couture; stalls sold woven ikat silk fabrics from Margilan, woodwork implements, ceramics, candies and cameos from all over. 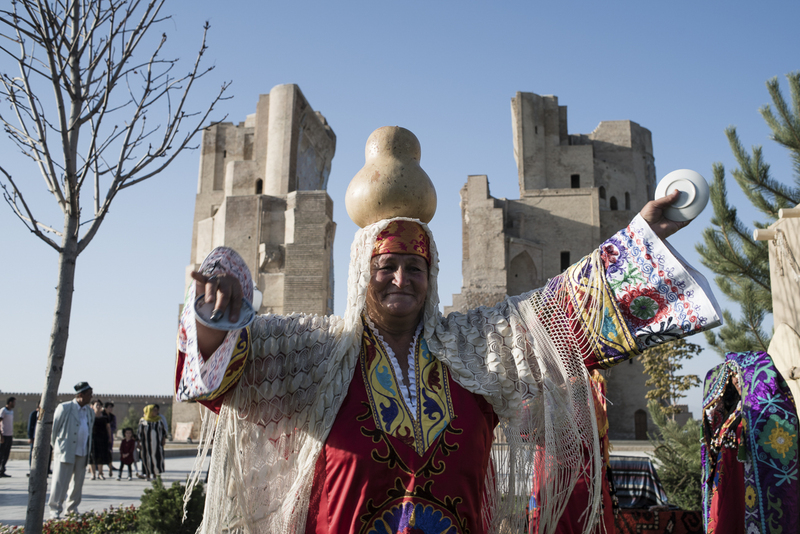 As a deep-lunged baritone belted out rousing standard on the stage of the Karakalpakstan section, footage looped endlessly behind him showing images of the autonomous region’s drastically spruced-up capital, Nukus. 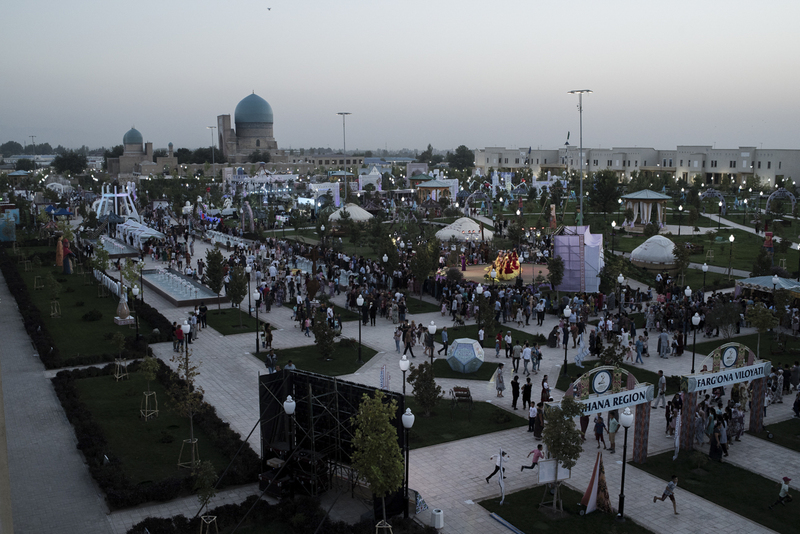 The Andijan pavilion drew fans of the region’s osh plov. The unspoken purpose of the event was to convey a vision of Uzbekistan as rich in cultural diversity but united in a love for local customs. It was as much an exercise in casting the nation’s image as in describing it. A few kilometers from this venue, down the heavy-handedly refurbished strip running south from the ruins of the Ak-Saray Palace – the summer residence of 14th century warrior-ruler Tamerlane – international scholars assembled at the town hall for a conference on the legacy of maqom. The cultural arm of the United Nations, UNESCO, has thrown its support behind the festival, which it argues is more than just celebrating tradition for its own sake. “Heritage is often seen only as sort of icing on the cake. The point is that intangible cultural heritage is also about knowledge, practices, social cohesion, cultural diversity. These are fundamental to sustainable development,” Jyoti Hosagrahar, director of the Division of Creativity at UNESCO, told Eurasianet. One of the minds behind the more scholarly component of the Maqom Art International Forum, Uzbek academic Soibjon Begmatov, had a more romantic take on the form to which he has devoted his studies.